I've wanted an iPad since it was released to read my technical manuals in the PDF format (mostly because the Kindle didn't work so well). 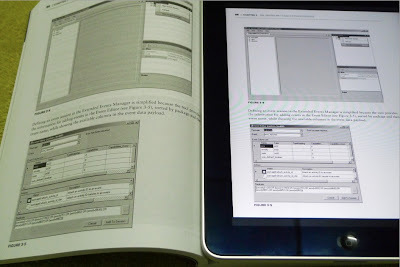 Unfortunately, I could find hundreds of iPad PDF viewer reviews online, but none of the reviews I found talk about the actual usability or display quality, and none of the iPad's I saw in real life have any PDF's loaded. I've walked up to strangers in public asking to see if they have technical PDF's in their iPad's, but all I've ever seen are games. Since I couldn't find out the quality of iPad PDF displays and I didn't want to buy one blindly, so I gave up the idea of buying an iPad earlier this month. But of course, fate works in mysterious ways. You need to click on the image to see the full size. The PDF's I loaded are Wrox's SQL Server 2008 Internals and Troubleshooting that I've been digging into lately, and a "borrowed" copy of Wiley's Mastering AutoCAD 2011 and AutoCAD LT 2011 so I can see display quality of images inside PDF. It has already been deleted as I'm not an AutoCAD user. iBooks is the ebook app and store frontend from Apple, but it also handles PDF files. The display quality is good. But like most Apple programs, there's no way to customize the program at all. Stanza is probably the most well known ebook reading app and it's available for every device. It handles PDF really fast, and there are all kinds of customization settings that helps the "reading experience". However, maybe because the program is optimized for real ebook formats such as ePub, the PDF display quality is really really poor. GoodReader is perhaps the best known PDF reader, having separate iPhone and iPad versions. There are tons of customizations, but none of them seem to be really useful. I also hate that it has page flipping animation if you swipe to turn the page, but no animation if you tap to turn. However, the PDF display quality is by far the best. As can be seen in the images below, the graphics in the PDF can be seen clearly without zooming, and the AutoCAD image is smooth without jaggies. ReaddleDocs is probably the most famous PDF reader since I see glowing reviews for it all the time and it's promoted everywhere. In fact, it was the first I tried. But it turned out to be really bad. Both the controls and image quality can't compare with any of its competitors. There is also a separate iPhone version available. Fast PDF is not fast. iRead PDF is the free version of iAnnotate PDF without the annotation features. iAnnotate PDF was popular for a while for being the first iPad PDF app that allows annotation simply by writing and marking with your fingers, but most of the competitors have now added similar features, and it just doesn't stand out any more. Also, it seems to be geared toward annotation and not reading, so the "reading experience" is lacking. There's no capture of the AutoCAD book since I just didn't care about the program enough to keep going. pdf-notes is a free app that allows annotation. But it's slow and doesn't handle PDF display that well at all. Once again, there's no capture from the AutoCAD book. It's quite obvious that the display quality of embedded graphics is greatly enhanced by anti-aliasing the graphics. But I looked and none of the apps have a setting to toggle anti-aliasing. It's either there (iBooks and GoodReader) or it's not (the rest), which is why iBooks and GoodReader are the best choices for PDF with embedded graphics. 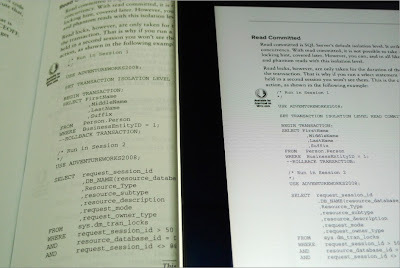 Finally, I have some photos taken with my iPad next to the SQL Book. 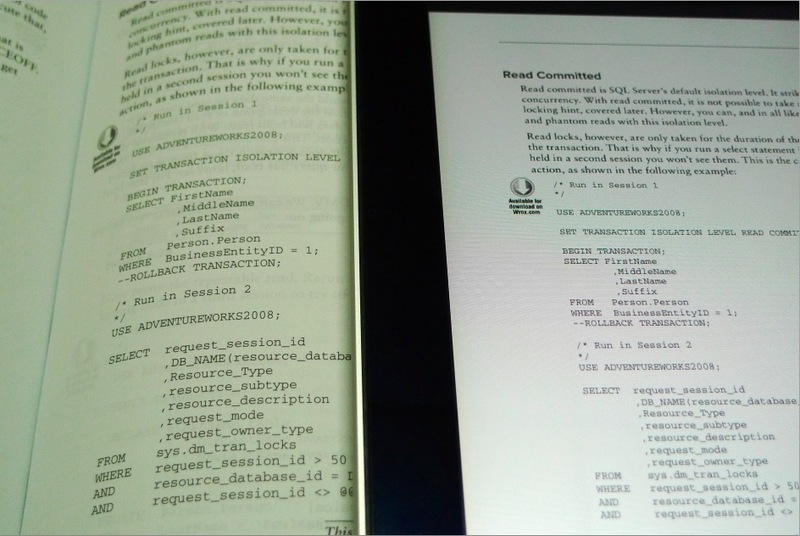 The first photo is the book opened to the same page as the screenshots above, and the second photo is opened to a random page that shows some code. The iPad is running GoodReader. Some moiré is visible on the iPad screen due to the low quality screen protector film. This is not a screen protector film review, but that particular film is so bad that after two days, I already have permanent markings on the film on frequently used areas such as the area where I tap to go to the next page! And I don't know where they get the "anti-reflection" from. Maybe it reflects so much light you get blinded so you don't see any more reflections. GoodReader is by far the best of the PDF readers I tried. However, I really don't like not having page animation when tapping to turn the page. The program is highly customizable, but the things that can be customized just aren't useful. But the display quality and speed more than make up for the shortcomings. As for Stanza, I've been using it for a long time on my iPod touch to read ebooks and I've customized it exactly the way I like it. I would continue to use Stanza to read PDF files that aren't technical books. Unfortunately, since GoodReader can't be customized as much as Stanza, I've had to "un-customize" some of my preferred Stanza settings so the two programs can behave in the same way so I don't keep confusing myself. iBooks is also recommended if you prefer to use Apple's ebookstore and don't want to customize anything.